Since Aedes aegypti and Ae. albopictus are both invasive species that breed in natural and man-made containers, measures that can be taken to keep them from becoming established in an area are important. Used tires have served as a very effective means of dispersal within the U.S. From its initial introduction in Houston, TX in 1985, Ae. albopictus has now spread to 40 states and the District of Columbia. Efforts to better regulate the movement of tires and to clean up and remove accumulations of tires in the environment can make a significant impact on these species. 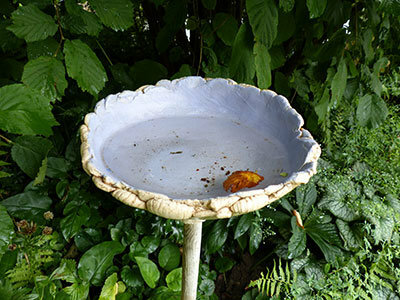 Typical breeding sites in residential areas are often man-made containers, e.g., flower pot saucers, flower vases, rain barrels, and trash. Clean-up and disposal of artificial containers is a necessity to reduce populations of these mosquitoes. It has been shown in numerous studies that populations of Aedes albopictus are often higher in poorly maintained residential areas with overgrown vegetation which provides resting sites and also hides breeding sites. Aedes aegypti and Ae. albopictus will breed in almost any container that can hold water for a 7–10 days. It is easier to control the larval stage of these mosquitoes as they are concentrated in defined habitats as opposed to the adult stage when they are mobile and occupy a much greater range. How do mosquito larvae and pupae look like? A bucket with rain water and mosquito larvae and pupae. As part of an integrated mosquito control, drain such breeding sites. 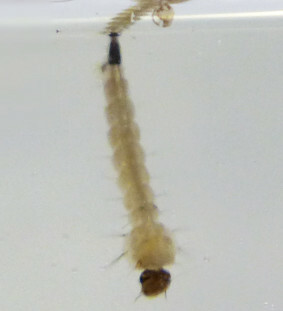 A larva of the dengue or yellow fever mosquito, Aedes aegypti. 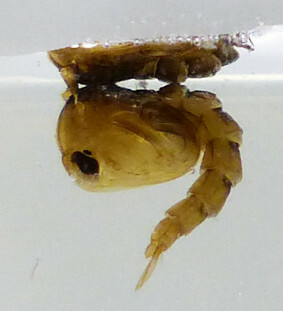 A pupa of the dengue or yellow fever mosquito, Aedes aegypti,´. If you lean over the bucket, the larvae and pupae will flee from the surface in a charcteristic winding movement. 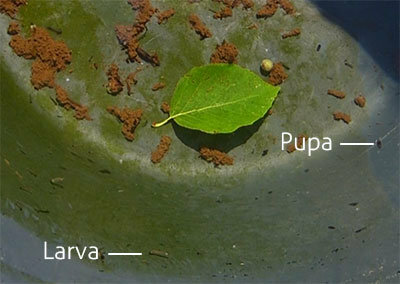 The photos below show some common sites where larvae of Aedes albopictus and Ae. aegypti can be found around the house. Often, breeding sites can be hidden or go unnoticed in even the best kept yards and gardens. You can still have a biting problem even though you have no mosquitoes breeding on your property, because one house on a street with productive breeding sources can produce enough mosquitoes to cause problems on an entire block. For this reason, successful control programs require a neighborhood or community effort. 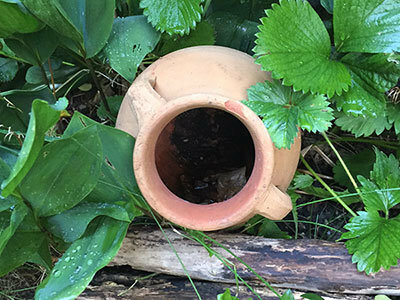 Discarding or emptying water holding containers is the first line of defense in an integrated mosquito control effort against container breeding species. However, constant vigilance is required to make sure water holding containers are routinely emptied after a rain event. Some containers may be too large to be emptied, and these can be covered or treated with a biological pesticide such as Bti (Bacillus thuringiensis var israelensis). Bti is probably the safest method for controlling mosquito larvae to prevent them from becoming flying adults. Bti is highly specific and toxic only to mosquitoes and a few related flies and will not harm people, pets, wildlife, or fish. Mosquito larvae consume the bacteria along with organic material in the water as they feed and once ingested, Bti will kill 95–100% of the larvae within 24 hours. The bacteria can be applied to any standing water as a granular or liquid formulation and can be purchased online and at most garden and home improvement stores. Always read and follow label instructions for safe use of pesticides. Occasionally, adult mosquitoes will be problematic despite the fact that they are not breeding in your yard. In this case it will be necessary to direct control efforts against the flying adults. Adult Aedes have a limited flight range (usually a few hundred meters) and tend to remain in the vicinity of suitable breeding sites, food sources, and resting sites. Both these species are primarily daytime biters; a habit that leaves them less susceptible to traditional mosquito control efforts that involve spraying pesticides around dusk or later in the evening when temperature and wind conditions are most suitable to achieve the desired coverage. Aedes aegypti also has a habit of resting indoors where normal pesticide sprays are unlikely to contact them. In the US, many areas are part of tax funded mosquito control districts that provide this service to all residents. In other areas, no such programs exist and local residents must find ways to solve their own problems. Recently, a number of pest control companies and dedicated mosquito control services have begun to offer backyard mosquito control. These companies primarily offer a residual or barrier spray treatment using synthetic pyrethroids or essential oil-based “green” pesticides. These treatments must be repeated every 1–3 weeks to maintain effectiveness. This can be costly over the course of the summer mosquito season. Also, insecticides are not specific to mosquitoes, but kill other insects that may even be beneficial (for example, as pollinators). The repeated and indiscriminate use of insecticides may also lead to mosquito populations that become more and more resistant. This can be a major problem in the case of a public health crisis such as an epidemic of a mosquito-borne disease. In these situations, mosquitoes populations have to be crushed quickly and area-wide to break the infection cycle, which will usually involve every control tool available, including insecticides. 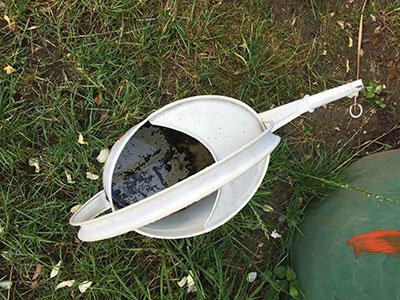 An alternative method for controlling adult container breeding mosquitoes is through the use of traps. This approach is especially helpful in integrated mosquito control. There are two types of traps commonly used: one that attracts host seeking females and one that attracts gravid females seeking a place to lay eggs. 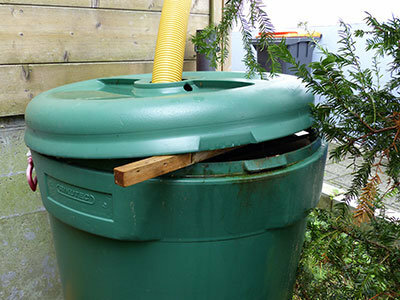 Biogents traps, such as the BG-Mosquitaire, are designed specifically to attract and trap container breeding mosquitoes. They utilize a patented trap design that consists of an attractive color contrast and a synthetic human skin lure that is dispensed to mimic volatile plumes from people. The BG-Mosquitaire is a low power trap that operates on less than five Watts of house current. Based on average U.S. energy costs (12 cents/kilowatt hour), this equates to less than 50 cents per month to run the trap continuously. By running continuously, mosquitoes are removed from the population every day. Overtime, this has a large impact on local populations that have very limited range. The BG-GAT (Gravid Aedes Trap) is a passive trap (requires no electrical power) that attracts females seeking a suitable place to lay eggs. 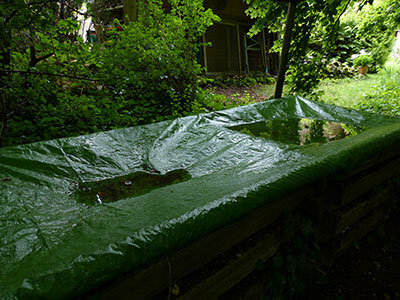 The trap consists of a black plastic container that is filled with two liters of water and ten grams of an organic infusion (alfalfa pellets, hay, oak leaves, etc.) and a clear plastic collection chamber that fits into the black container. A black funnel opening is located on the top of the clear container and a black nylon net covers the bottom to physically separate the chamber from the water source. A double sided sticky card is hung inside the chamber to collect all mosquitoes entering the trap. The benefit of this trap is that it removes females that have already taken a bloodmeal from the population. These are the mosquitoes that are most likely to have acquired a mosquito-borne virus and present the greatest risk for disease transmission. If you are interested in more information about the BG-GAT, please see our BG-GAT Product Page. Previous studies in Italy, Texas, and New Jersey have all shown that by using BG powered suction traps in clusters, biting rates from Aedes albopictus can be significantly reduced. By adding the passive BG-GAT to the program, results can expected to improve. 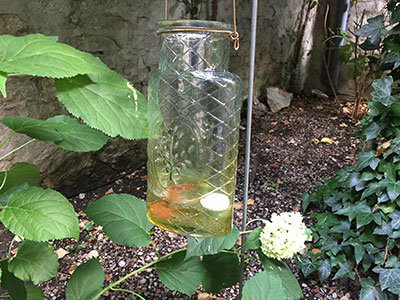 In 2017, studies using both trap types were conducted in neighborhoods with Aedes albopictus problems in Louisiana, New Jersey and Switzerland. Additionally a neighborhood wide control project using over 1000 BG-GATs is underway in University Park, MD. If you are interested in more information about the studies, please see our Scientific Foundation and Publication Page.